Pop! The toast comes out in the morning and gives you the perfect crispiness that you love. Having a toaster at home is a necessity. In fact, we always endorse you to buy a 4 slice toasters instead of a 2 slice toaster. Why do we say this? Majority of the working people are in a rush early in the morning, they do not have time to toast many slices of bread. In such cases, a toaster which accommodates 4 slices is good for someone with a great appetite or a family of three to four people. Does that make sense now? Since you are buying a new appliance, you must always read the reviews to be a wise buyer. Buying a new product is like an investment and you must take it very seriously! 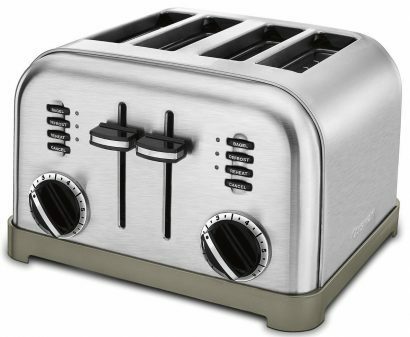 Here is a post for you in which we have listed the Top 10 Best 4 Slice Toasters in 2019. You will find everything that you are looking for in this post. Take a look! 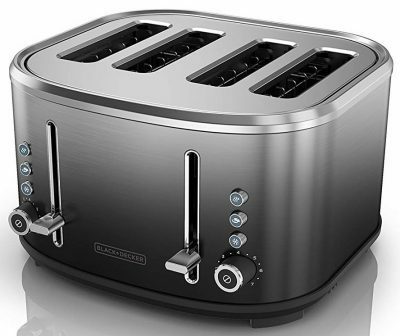 Hamilton Beach Classic Chrome 4 Slice Toaster has a cool touch exterior. 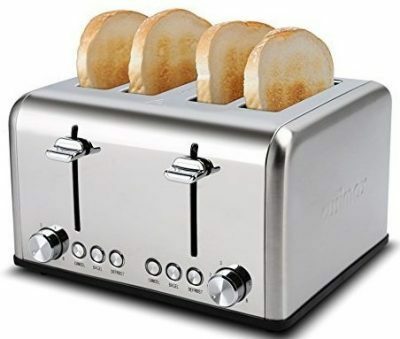 It automatically shuts off when not in use and the toast is ready. The product has extra wide slots which can accommodate any shape of bread. There is a special toast boost feature which lifts the slices higher. The Oster 4 Slice toaster brushed metal can easily accommodate a number of items. 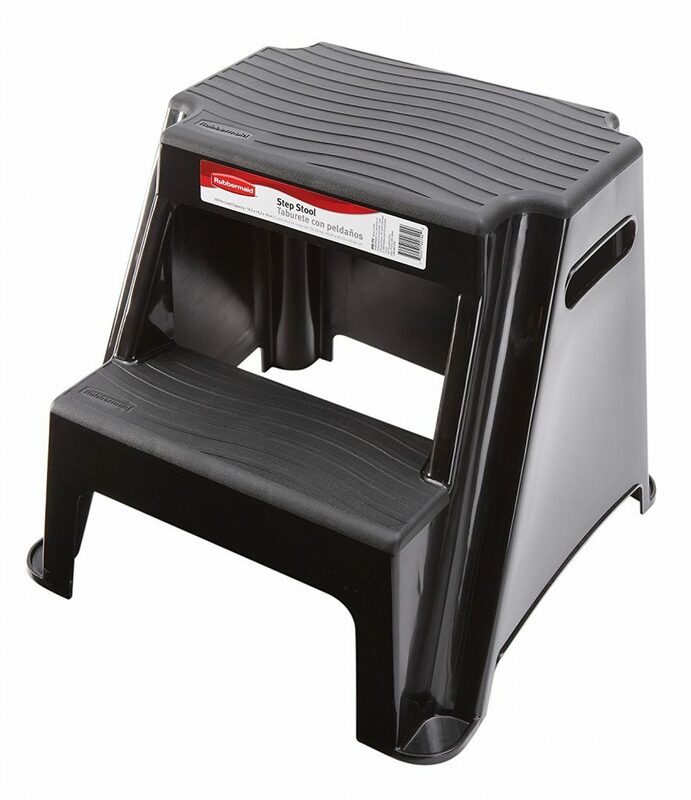 The toast lift level is meant for easy removal of the toasts without burning your fingers. You have the luxury of choosing from the 7 toast shade settings. Whether you want your toast light or dark, this toaster does it for you. There are 4 modes such as bagel, cancel, frozen, and reheat. Cusimax is a great brand and the 4 slice toaster offered by it is meant for your enjoyment and hassle-free mornings. It can accommodate a number of bread such as bagels, waffles, white bread, meal bread, buns and much more. 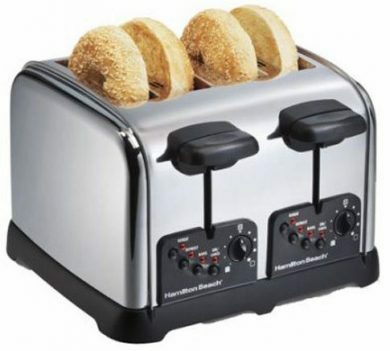 It has multiple toasting functions which include bagel, cancel, and defrost. 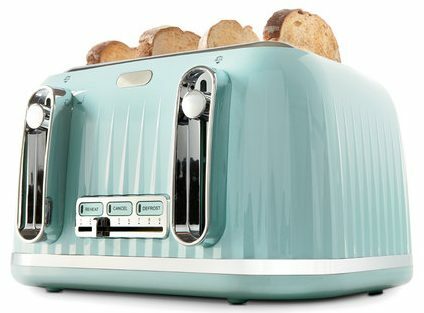 The extra-wide slots accommodate sliced bread, buns, muffins or thick pieces of bread. Cuisinart CPT-180 Metal Classic 4-Slice Toaster has dual control panels and customs control. It has extra wide toasting slots and lifts lever. The crumb tray slides out for easy cleanup. The product is BPA free and an instruction book is included with it. Take a look at the features! 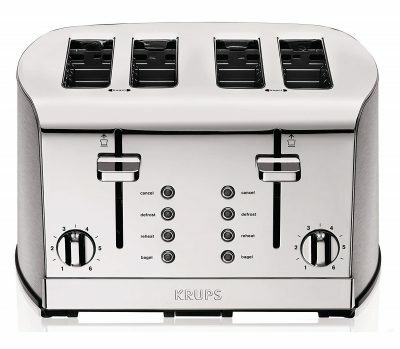 KRUPS KH734D Breakfast Set 4 Slot toaster has five functions which include defrosting, reheat, toasting, cancel, and the bagel. There is a special high lift level lever which allows you to easily remove the toast. It comes with the 2-year warranty as well. The Black Decker 4 Slice Extra Wide slot toaster is meant for hassle-free use. There is an extra lift which allows easy removal of the toasts. The extra-wide slots can accommodate different types of artisan bread. There are seven toast shades available with the help of a knob. The product looks stylish in the kitchen with its modern design! You can select from seven toast shades with the help of a knob. 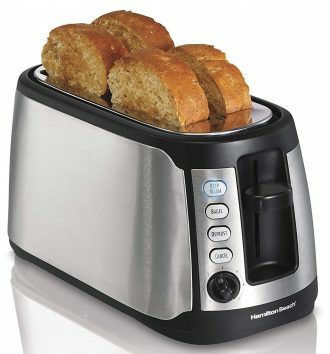 Hamilton Beach 4 Slice Long Slot can fit bagels, long bread and much more. 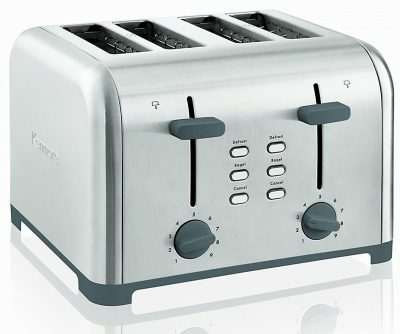 It has a keep warm setting which keeps the toast warm for extra minutes. The toast boost feature is the best which lifts the toast slightly higher for hassle-free removal. Keep warm setting which keeps the toast warn for extra minutes. 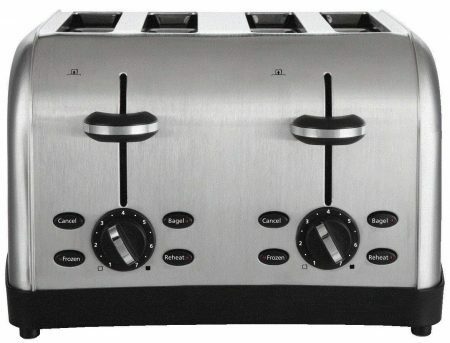 Kenmore 40605 4 Slice Toaster has 4 slots which fit the variety of shapes of bread. There is the bagel, defrost and cancel functions in this toaster for your convenience. The good part is that there is an electronic shut off system which is automatic. It has a stainless steel exterior which you can easily clean. 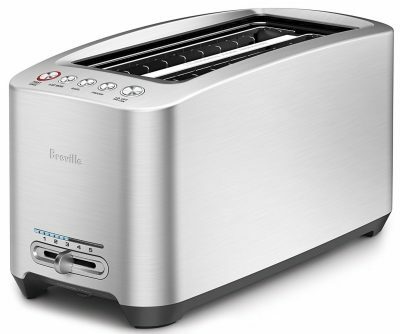 Breville BTA830XL Die-Cast 4 Slice Toaster has 4 slots and it can accommodate any shape bread. It has an LED progress indicator which indicates to you whether the toast is ready or not. It also alerts you when the toast is done. You can even adjust it to mute, low, or high for your convenience. 4 slice toaster which accommodates different shape bread. LED indicator which shows the toasting progress. Toaster sound alerts can be adjusted. 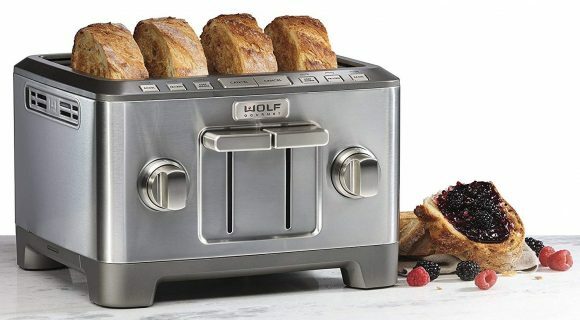 Wolf Gourmet 4 Slice Toaster WGTR104S has extra wide slots; it can accommodate all types of bread slices. The shape and size do not matter as this toaster has slots for easy accommodation of the bread. Each of the slices is held with perfection so that each of it gets browned. Here are the features of the product which will help you to narrow down your choice. There are special bagel settings. There are two slide-out crumb trays. You can toast thin or thick pieces of bread with ease. Extra-wide slots for thin, thick and any shape bread. We hope that this post was helpful for you in some ways! 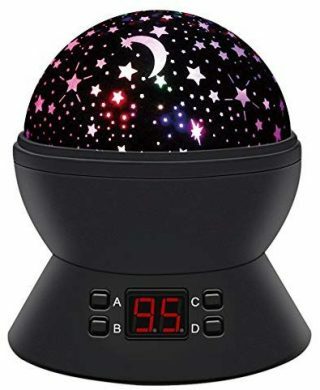 Choose a product from the above-mentioned list as they are available on Amazon. Buying it from a genuine platform is important, as there will be easy replacements or money-back offers. So, skim through all the reviews and choose the best product out of the Top 10 list. Having a toaster in your home is a basic necessity and it is also an easy breakfast fix. Buy the best!